For those that don’t know.. I finally broke down and bought an Xbox360 a couple weeks ago. For an MS product, they did a lot of things right. The ability to turn the unit on and off via the wireless controllers alone is rather cool. The tie-in to xbox live is very nice too: Buy some smaller games on the cheap (Uno is loads of fun.. yes Uno, the classic card game), you can buy add-ons/themes/etc, and the achievement system for 360 games is neat. 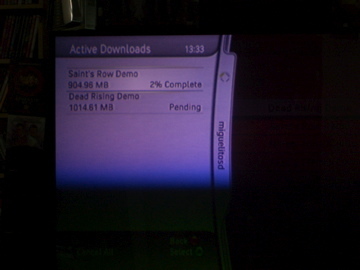 but saw that they’d put up a demo for it so figured I’d snag it, along with the demo for Saints Row (a GTA clone coming out). Damn those are huge.. we’re talking just under 1Gig per demo average. I knew when buying the unit that the 20gig disk wasn’t really big enough to last. Of course that’s 20 HDD manufacturer gigs too, which really means about 18-1/2 Gig. Remeber boys and girls.. the manufacturers like to say that 20 billion bytes is a gig, but computers do math in base 2 vs base 10 so take your drive size and divide by (2^30) for gigs to get the real size.. not to mention there’s a little overhead from the filesystem. Anyway, we’ll see how the demos are, but man I hope there’s a way to put in a larger laptop harddrive sometime soon. So I played in 2 Hold’em tournaments over the long holiday weekend, one on Friday, and the usual Sunday game. The Friday game was a $35 buy in, $3k in chips, no rebuys or add-ons. I had K10s and was sb. Noone raised, and I called. Flop was A73s so I flopped the winning flush. I put in $800 (blinds were $400/$800 at this point) and everyone folded but one other guy, and I’m thinking he’s got the queen flush, which would be great for me. The turn comes out 5h. I check and he goes all in… so I call all in (thinking I’ve suckered him in). I turn up my hand and everyone “ooooh”s.. then he turns up a 3/5 off suite. I’m favored 92% I believe.. then the river comes out.. 5c! He hits his full house and knocks me out.. damnit. Sunday’s tournament is similar. I was playing even better, and was up to $25k in chips or so, after rebuying 2x during the start, so horrible start but now doing very well. Blinds are up to $2k/$4k and I get J8d. A few call, noone raises. Flop is JJ7. I’ve got a set. The first to act goes in for $17.5k, everyone folds and I figure he’s got a jack too, but what the hell. He even says (after I call) “oh, you’ve got the jack, don’t you?” And I did.. he flips up AA. The turn comes out… Ace! Damnit.. he’s hit his set too, and it’s better then mine. River is something lime like a 3.. so I’m again knocked out with a pretty strong hand. Damnit. Well, actually, I had $7k left, but at that point I was basically out.. had to go all in with next decent cards as blind came around to me and I lost. Will have to see how I do this coming weekend. I’m definitely getting better, learning to read people more and knock out people with only medium strength hands by betting properly. All in all, even when I lose I have fun so it’s worth it. So two weeks ago, Bert and Rick wanted to try out playing a real Texas Hold’em tournament, so we went out and played the $13 10am Sunday one at Sycuan. None of us won any money, though Rick made it to the last 3 tables before getting knocked out. While there, I found the new WPT table game… which I’ve come to really enjoy. Anyway, had enough fun with the tournament that I went back alone last weekend, and again today. Today, I made it to the last table! Everyone decided to split the pot, well, the 2 chip leaders took $250 each, and the rest of us took $198. Sure, could’ve won a bit more if we’d played and I’d made 3rd place or better, but in the end, this was the smart play for us. Anything less then 3rd place would’ve been less and less money, this way, we all got a decent amount. Oh, and I also got 3 $5 bounties for eliminating people. 🙂 Then I lost all the money playing the aforementioned WPT game… then won it all back, plus a bit. So a good day overall.